I cannot remember the last tutorial I wrote for the blog. It has been way too long for sure! I was so inspired by this block, I simply could not help myself! 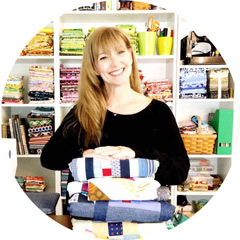 This is an excellent scrap buster and works beautifully with a variety of fabrics! For my blocks, I used Denyse Schmidt Katie Jump Rope, Flea Market Fancy and a smattering of Hope Valley that I adore! The charm of these blocks is the variety of colors and the imperfect feel of the stems keeping it more folksy. You can either used curved piecing or appliqué for the stem. It is whatever you feel most comfortable doing. I will give directions for the curved piecing. To keep with the feel of the original ( the stem was hand appliquéd) the stems are not perfect since they are more free form. Imperfect works with this block! 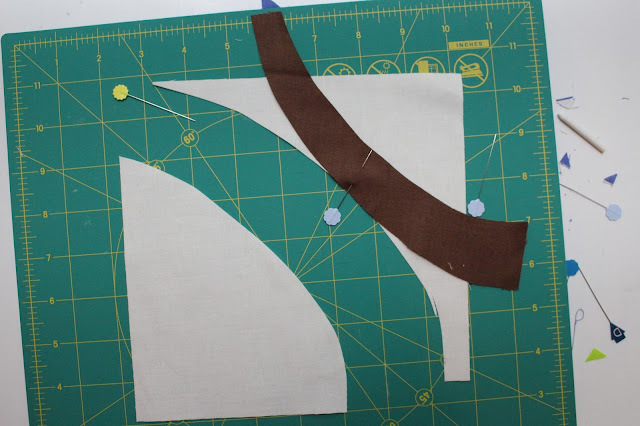 I am not a hand appliqué expert, so I will give you the template which is the same for either method and would love for you to check out Jen Kingwell's video tutorial on Fat Quarter shop for some expert tips! Please read through all the instructions before starting this block. If you have any questions please shoot me an email. All seams are 1/4in unless otherwise noted. Then sew 1/4 from the center marked line the other side. I used chain piecing to save time and thread! Press the blocks your preferred way. I chose to do mine 1/2 to the dark side and one half to the light. Trim the hst to 3inches. Lay out your leaf to get an idea for the scrappy placement! Then start start stacking your squares in each row right sides facing. I pin all of mine on the side I will be sewing so I do not get confused and sew the wrong two together ( has totally happened many times)! Using a 1/4 in seam, I chain piece all the squares together! Press them in your chosen method. And you are already this much closer to having finished this block! You will be sewing together the rows again but in the middle section, instead of doing the row across, you will be sewing the two star points together. When sewing the seams together, you should try to but up the upper and lower sides and then pin so there will be no shifting. I am a firm believer in pinning as you will see coming up! When you have sewn almost everything together, there is one part left to complete. The stem! 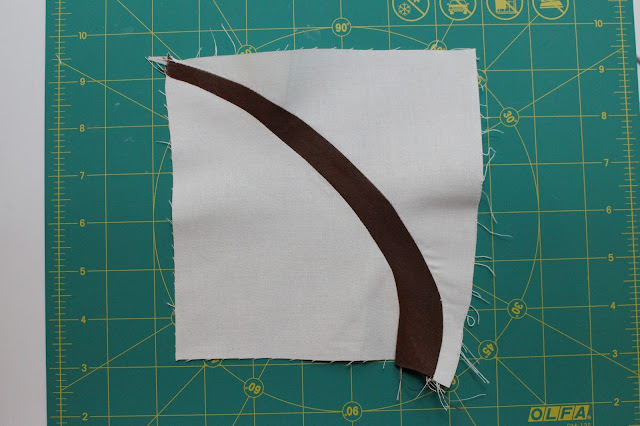 If you will be doing hand appliqué, use the same template, press the outer sides 1/4" under, place on the 5.5" square and follow the link to Jen's tutorial mentioned above. For the curved stem, I sewed a number of different ones and this was the best one that keeps with the feel of the original one without the hand stitching. Print up and cut out your template, then pin to your brown fabric. This is a bias cut so make sure to lay the template as shown. For the curved piecing stem place the template that you cut out of the brown fabric and place it on the 7in square. Cut around the template piece and the solid square. Discard the solid cream fabric and flip the stem piece so the center of the curves match up and pin in place. 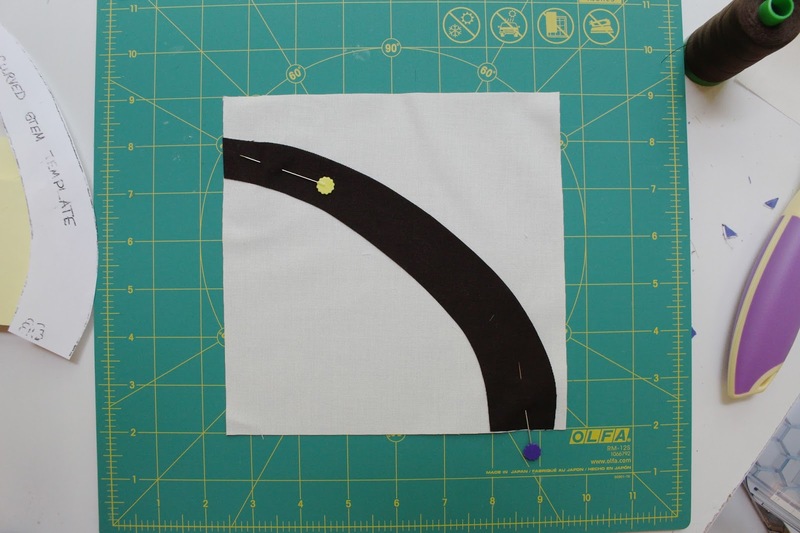 The fabric is cut on the bias and you will be able to manipulate it to bend around the curve. It is really very cool! I LOVE pins, I may have mentioned that previously ;) There are geniuses out there that CAN sew curves without pins...I am not one of those people! If you can do it, go for it! Again, using a 1/4in seam, slowly sew around the curve making sure the bottom fabric is not bunching up under. I take the slow and steady path. If your fabric does get bunched up and you realize it after the fact, take a few stitches out ( no need to rip it all out) and then smooth it out, pin it and sew it up! Flip pin, sew and press the opposite curved side! The stem will look very wonky! This is totally OKAY! I made it a bit larger so we can trim it down to a 5.5in block! 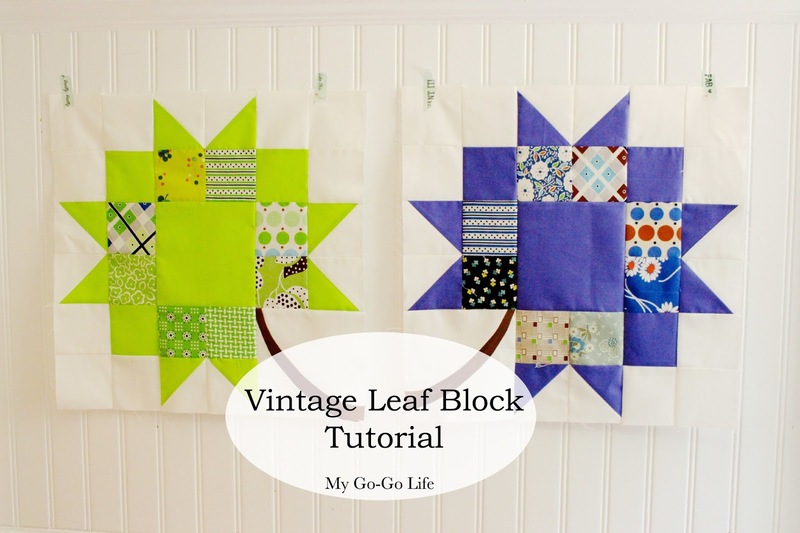 Now you can finish up the rest of your rows, press them and you have some amazing Vintage Leaf Blocks! I hope you love this tutorial and make lots of these beautiful blocks! I already have the orange/yellow and pink picked out to make this week! Please join me! If you do make the blocks I would love for your to share them, please add the hashtags #vintageleafblock and #gogokim so I can see them all! I am planning a linky party with a giveaway sometime in the next month to make it more fun! thank you for this tutorial, i have made a reference to it and will have a go, maybe not the branch though that might have to have an applique straighter one! A very cool block and an excellent tutorial! Pins are a gal's best friend, IMHO!!! What beautiful blocks - those curved stems stole my heart!